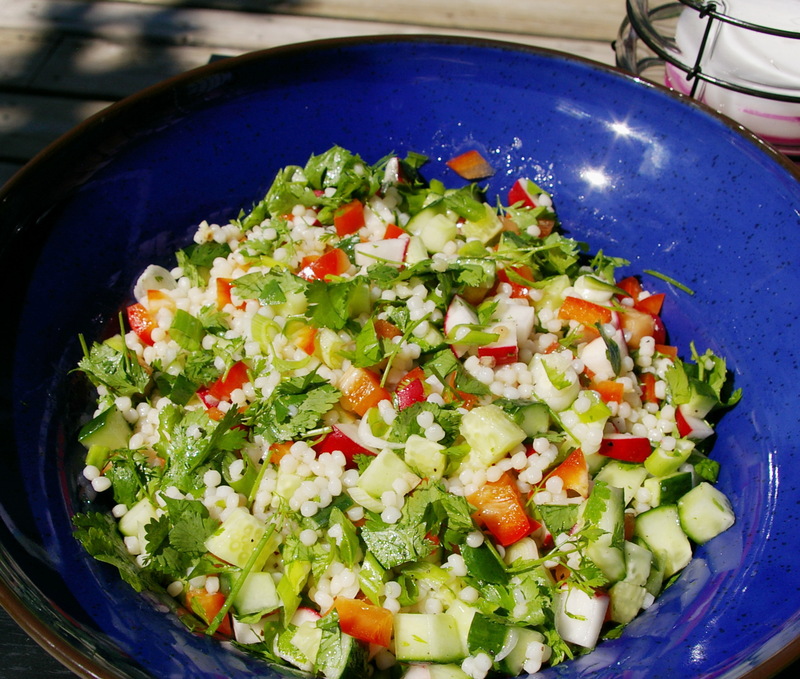 Israeli couscous is larger than the regular couscous, and makes a fabulous salad with great texture. It’s versatile and easy to make even if you don’t have much time. I use the recipe as a guideline but usually end up adding a little more of the things I like or have on hand. It is a very refreshing salad to serve with a nice spicy dish as it compliments it and is cooling on hot days. 1. Bring a medium sized pot of water to boil with a pinch of salt . Add the Israeli couscous and boil until they are Al Dente or just soft about 5 or 6 minutes. Drain, rinse in cold water. To cool faster you can put bowl sitting in another larger bowl with ice in it , otherwise just cool and put in refrigerator until putting together with other ingredients. 5. Put the cucumbers, tomatoes, coriander, green onions, red peppers and other veggie and herbs you like into a large bowl. Add the cooled couscous . 6. Whisk together lemon jice, garlic, salt and pepper, and olive oil and pour over the vegetables and couscous in the bowl. Stir well, taste adjust if needed add more lemon or salt . This entry was posted in Recipe Index, Salads and tagged couscous, Salads by Ginger Smoothy and Otto Pilot. Bookmark the permalink.